After a break of several weeks, Jinty’s favourite spooky tales are back. This one teaches a girl a creepy lesson about not dithering so long in bed that she runs late for school. Katie the jinx is on holiday, but Clarence, the boy her cousin Janice is expected to pair up with because they are neighbours, is really spoiling things. He’s such a snob and a prig who always makes put-down remarks about everything Katie does, and he never loosens up. Dora’s not having much fun on holiday either. Even then, Ma Siddons makes her the dogsbody – especially when she wants Dora’s help in winning a talent contest. It’s the final episode of “Daddy’s Darling”. Daddy, having finally seen the light in the previous episode, makes up for things in a big way to deliver a happy ending. Next week we see the start of “Barracuda Bay”, which promises us adventure, mystery, the Bahamas, a sunken ship and disappearing scientists. Sounds like an exciting mixture already! Debbie finds the courage to stand up to bully Tracey and finally gets the brooch off her. But then Debbie realises that she stole the brooch when she promised Mrs Maynard she would not steal again. So the Valley of Shining Mist may not take her back unless she can sort out this tangle. Hilda agrees to come back to Misery House to keep the peace with the Warden and release Merry from punishment. The gypsy’s herbs have made her so fighting fit that she’s strong enough to stand up to Adolfa the bullying toady. Something may catch on from this because the blurb for next week says: “‘Up with the barricades! Down with Misery House!’”. Woozums the dog is suddenly standing up bullies too. In this week’s episode of “Cinderella Smith” he’s taking a growl at the nasty cousins on Cindy’s behalf. In “Blind Ballerina” a tipster provides the lead to Daisy’s whereabouts. But now it’s Barbie who’s disappeared! Flo gets the worst birthday ever. Greg is so busy that all he can do is send her a bunch of flowers. And then Flo is so shocked when she finds out Greg’s off on an American tour that she blunders into the road and gets hit by a truck! Julie and Mary finally deliver the message to Moura that her Aunt Zella is a traitor and in league with Mr Blackburn. Moura believes it, but Zella is making sure she can’t convince her father and stop the soldiers who are on the verge of planting explosives that will destroy their world. Katie the Jinx is pushed off the cover this week in favour of this delightful Phil Gascoine piece that advertises Jinty’s latest competition for winning a guitar. The dancer looks like she’s got one leg, though. Presumably the other is under her skirt somewhere. When Katie is pushed off the cover her strip is usually reduced to a two-page episode, and this is the case here. Katie is minding her little horror of a cousin. Things turn to horror all right when he loses his ball and Katie gets herself into all sorts of scrapes and in a real state trying to retrieve it. And after all that, the little brat says he’s gone off his ball and wants to play on the swings. He doesn’t even thank Katie for getting his ball back. No wonder poor Katie faints in the last panel. The hostage crisis at Misery House continues. The Warden allows Merry to go to the gypsies to deliver her ultimatum: return Hilda, who has not recovered from her illness, in exchange for Jessie, who is going mad from her illegal confinement at Misery House. As it turns out (in the next episode) the gypsies should have responded with a gypsy’s curse on the Warden and Miss Ball. As it is, Merry and the gypsies resort to a bluff to trick the Warden into returning Jessie. In “Blind Ballerina”, Barbie and her friend Pauline go in search of Daisy, but don’t have any luck. And once they return, Sylvia pulls another trick to get them into trouble for staying out. It’s gambling on the greyhound racing in Dora Dogsbody this week. Mr Siddons finds some backbone too when he thinks he’s lost because of Ma Siddons and stands up to her by arguing with her. Debbie’s family manage to force the story of “the Valley of Shining Mist” out of her. They don’t believe a word of it of course, which should keep the secret safe. Then Elaine has second thoughts, which puts it in danger again. Meanwhile, Debbie still hasn’t got the brooch off bully Tracey Stocks, and now Tracey’s teasing her even more when she discovers Debbie’s secret violin practice. Cinderella Smith has to put a brave face on losing her first earnings to her cousins. Still, her next job is coming up, and in the last panel she’s on a high when she slips off for it. Julie finds out Zella the evil Green Woman is in league with Mr Blackburn. But they run into difficulties trying to tell Moura because Zella is starting a war of nerves in both the kingdom below and the military above. 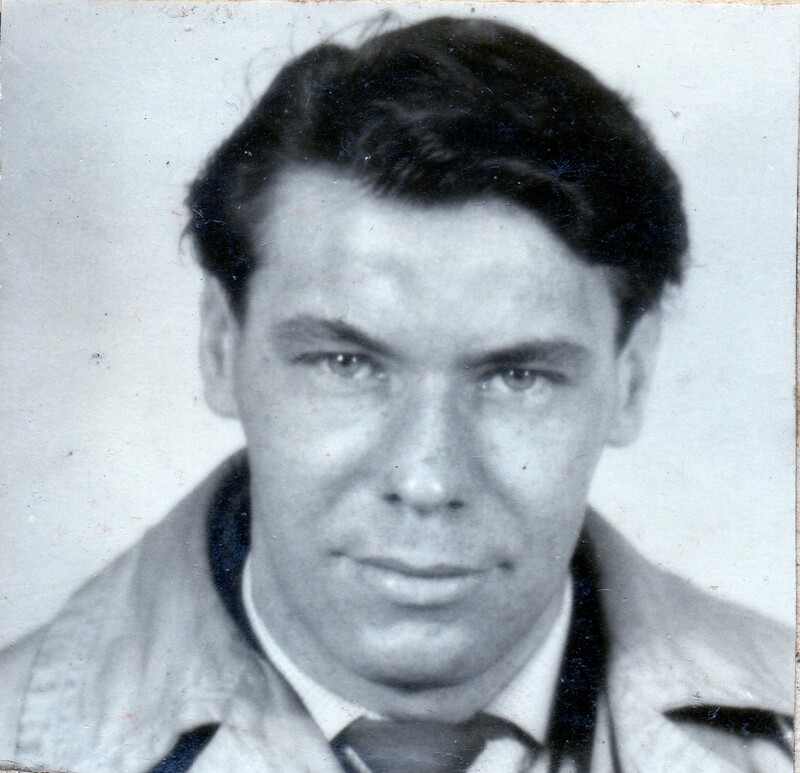 It is the penultimate episode of “Daddy’s Darling”. Daddy finally realises how cold and selfish he has been after seeing how selfless and brave his darling was in trying to rescue the evacuees in a fire. However, there’s no sign of them and it looks like they’ve perished. Moreover, Lee is now in intensive care and sharing her ward with the evacuees’ grieving mother. Flo and Pip resort to unusual measures to make sure Greg has a good rest because his nasty manager Vince Telfer is driving him too hard – they smuggle Greg out in a drum under Telfer’s nose and take him off for a holiday! However, it has unfortunate consequences Flo did not anticipate – it caused Greg to miss his chance for a tour in Las Vegas. The issue is a bit unusual in that there is no Dot, quiz, competition or special feature. Only the ads intermingle with the flow of the stories. 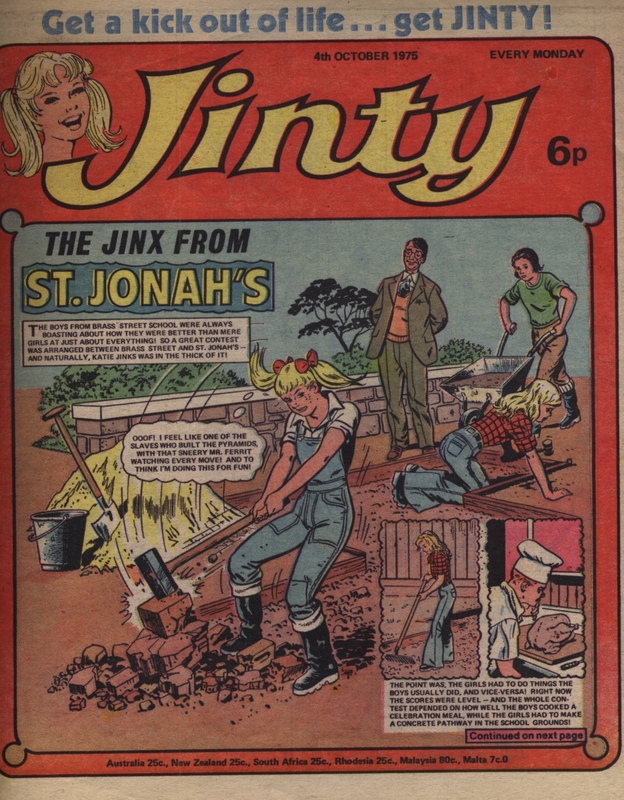 This week’s Jinx story is curiously similar to a “Fran’ll Fix It!” story that appeared in 1978. Our protagonist and her friends stick on false beards and other facial hair – only to find they won’t come off because of our protagonist’s special homemade glue (made with glue from the makeup kit, flour, nail varnish and stuff for mending bathtub cracks!). After several failed attempts to get rid of their “hairy appendages”, they finally succeed after they work up sweat during one of Katie’s scrapes. This is not unlike how Fran must have worked herself up in a sweat getting away from Sheikh Abbis and then jumping into the duck pond. Could it be the same writer? Barbie gets the role of the blind ballerina in the production. Talk about irony. Unfortunately other dancers turn against Barbie in this episode, which will make things easier for jealous Sylvia. And now Pauline has discovered Barbie’s secret. Someone in the company had to at some point. Fortunately it is not Sylvia – but how long before that happens? Despite Merry’s efforts to stop Miss Ball capturing Jessie, she succeeds and is now holding Jessie hostage to force the gypsies to return Hilda to Misery House. Jessie’s going mad from her confinement in a Misery House cell, which is precisely what Miss Ball anticipated because gypsies are outdoor people. It’s all part of her plan to turn the screw even more on Merry to make a choice between Hilda and Jessie – or think of something fast! This week Dora Dogsbody is trying to help a dog overcome his fear of water. She succeeds – unwittingly – when she develops cramp in the pool and the dog dives in to fish her out. But that sneaky Ma Siddons steals the credit and charges the owner extra for it! Another episode where Dora does not score a total victory over Ma Siddons, but she takes solace in the fact that the dog is cured. Cinderella Smith hides her first cash payment from her cousins by burying it in the garden until she is ready to bank it. But she had not counted on Woozums’s doggy trait of digging things up in the garden. Now the cousins have found the money. Julie finally decides she has no choice but to take her sister Mary into her confidence about the Green People. Unfortunately her enemies have guessed she would try something like that, so now they are watching Mary too. As a result, they meet the evil Green Woman, Zella, and now they join forces. Oh, crumbs! Lee finds the evacuees, but they can’t find the mother and Daddy won’t let his darling help with the search. And now it looks like the evacuees are trapped in a fire! Greg’s manager exhibits more of his selfish, greedy, uncaring attitudes to his own discoveries. He’s driving Greg so hard that his health is suffering. He sacks Pip the drummer – and punches him in the face – for helping Flo when she tries to step in. Undaunted, Pip and Flo hatch a plan to help Greg.